New McGuire’s Location Now Open In Centereach! 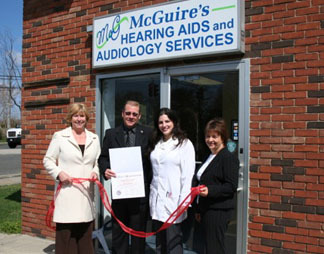 McGuire’s announced this week that the hearing services provider has opened a seventh location to better serve its growing patient base. The newly-opened office is at 2297 Middle Country Road in Centereach. Appointments can be made by calling the office at 631-585-1212. Above: Brookhaven Town Councilwoman Kathleen Walsh (left) attends the McGuire’s Ribbon Cutting Ceremony in Centereach on April 23. Also shown is David Carr, McGuire’s owner, McGuire’s Audiologist Dr. Katherine Frangos (center) and McGuire’s Patient Care Coordinator Martha Murch (right).